Can Marble Windowsills Be Installed Outdoors? Absolutely! When it comes to building the dwelling that you prefer, it’s whatever you want. You really can’t go wrong with natural stone. It has proven to stand the test of time throughout the ages. Incorporating marble into your building project is going to be one of the best investments you make for your company. Installing marble window sills is also going to be the most cost-effective way of upgrading your build to a more luxurious setting. It’s not going to cost as much as marble flooring and because of its size, you’ll be able to stock more inventory in your warehouse. Usually, price and storage are the two main obstacles here. Marble tends to run pretty high as far as costs go. So if you’re trying to install marble in a space that has a great deal of square footage, you’re going to need a lot of product. What’s more is that you’ll need to find a place to store it all. And if you’re in the construction business, you already know that the real estate in your warehouse is precious. Every bit of space counts. Stonexchange, a wholesale marble window sill and threshold distributor based in Miami, Florida packages our marble window sills in a strong wood crate that can hold anywhere from 50 – 100 pieces of marble window sills. They’re not only stackable, but also tightly secured ready for nationwide shipping. Can You Install it Outdoors or Not? There’s been some speculation as to whether or not you really should install marble window sills out doors. The thing to remember is that marble is a stone, so incorporating it as a window sill, whether it’s indoor or outdoors can very possibly add value to your home because it’s a type of material that lasts long. Overall, marble is a waterproof type of stone. It’s going to withstand moisture unlike the other alternative window sill material, and the chances of you having to replace it are slim to none, unless some type of unfortunate catastrophic event occurs. This alone speaks volumes to how resilient marble is. Installing it as an outdoor feature will instantly update the exterior of your home to a modern-day build. Marble’s surface has a natural gloss. As an outdoor window sill, this gloss will reflect the sun and even for homes in the cooler climates, the marble window sill will reflect the winter snow bringing about a sparkling twinkle to your curb appeal. While marble is waterproof, it is a porous type of stone. The pores on a marble surface is microscopic to the naked eye, but can absorb enough moisture to discolor the surface if it’s not treated properly. That’s why you can get a sealant that’s especially for marble that you should apply every 12 months, especially if you’re installing it as an outside sill because it will be exposed to the elements. What is the Sealant For? 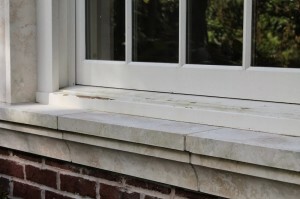 The sealant is recommended if you prefer your marble window sills to look they way they did the day they were installed. However, if you’re content on letting nature take its course and let the marble stone morph into another shade according to how exposed it is, that can look attractive to. The weathered look on natural stone is sometimes preferred as there are different types of surface finishes marble stone has. Polished – This is the type of finishing that most of us are familiar with when it comes to marble tile. While the slick finished surface will definitely make your curb appeal attractive, as aforementioned, if you want your polished marble window sills to look as good as they did the day they were installed, then you’ll need to maintain them with an annual sealant that you can get from your home improvement store. Otherwise, the luster will fade. But this isn’t always a bad thing either, because your polished look will turn into a honed finish. Honed – If you prefer something that’s a little more toned down in regards to luster, the honed finish might be another option for your outdoor window sills. This type of finish is buffed to slightly dull the surface appearance. Bush-Hammered – If you’re looking for a bit of texture to your window sill surface, then the bush hammered finish is just what you need. This type of finishing is perfect for outdoor window sills and will complement any stucco or brick finish. Leathered – The leathered look is the most contemporary type of window sill finishing. The leathered technique is a cross between the bush-hammer and the honed approach resulting in a surface appearance that isn’t as glossy as polished marble, but has enough luster to make the honed treatment appear like it’s leather. Sand Blasted – For a completely textured look and feel, the sand blasted technique will offer an extremely abrasive look that’s also rough to the touch. If you’re completely unattached by the shine of marble but want a marble window sill simply because it will last long, this is the finish you want. What Types of Marble Window Sills are Available? Marble window sills come in a variety of different color variations. When you’re in the construction business, you need to choose the type of marble window sills for your construction projects carefully. View Stonexchange’s exclusive marble window sill selection here. Contact us online today to inquire about a discount on your bulk order or call 1-305-707-6062.